Nuzzel aims to help you get control of the firehose of news and information constantly flooding forth from social networks. It curates news stories shared by your friends on Twitter and Facebook, presenting them in a simple stream that you can scroll through. Or if you prefer, it can repackage articles into a daily email. 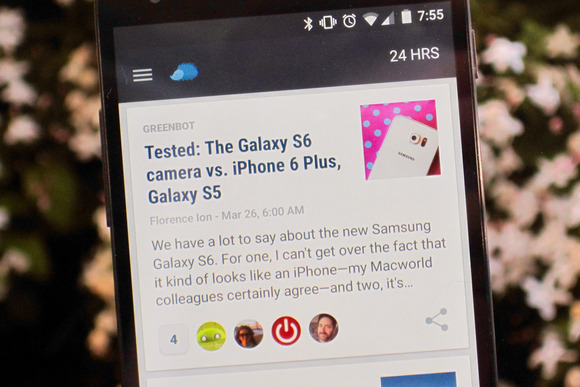 The new Nuzzel for Android joins existing versions for iOS and the web. Nuzzel for Android is designed for finding news your friends are sharing and sending along your favorite articles to others. The Android version is well thought out, with layout and animations adhering to Google’s Material Design guidelines. Content is broken up into cards, with a prominent reshare button if you want to send an article to someone else. You’ll need to login with a Twitter or Facebook account so Nuzzel can mine your social feeds. Nuzzel also offers featured feeds, which are collections of articles from the accounts of public figures. The impact on you: This is a great app to check out if you’d like a more curated approach to news. Nuzzel succeeds by latching on to a singular purpose and executing it well. It doesn’t try to create another social network for you to join, it instead just does a good job at pulling together what your friends and others are reading and sharing. This story, "Nuzzel for Android creates a curated feed of the news your friends are reading" was originally published by Greenbot.